Chris Hart's Humongous Book of Cartooning is a great value book covering everything the beginner needs to master cartooning. It teaches how to draw cartoon people, fantasy characters, layouts, background design and much more. This latest cartoon title from Chris Hart, the world's bestselling author of drawing and cartooning books, packs a wallop. It's the cartooning book that has it all: cartoon people, animals, retro-style "toons'", funny robots (no one has ever done cartoon robots in a how-to book before, and movies like "Wall-E" and "Robots" were smash hits and prove their appeal), fantasy characters and even sections on cartoon costumes, character design, and cartoon backgrounds and composition. 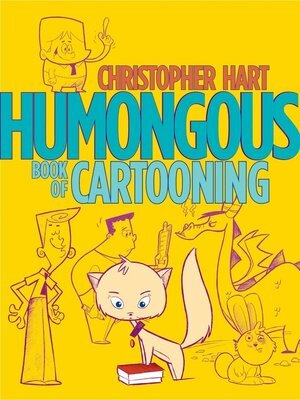 The Humongous Book of Cartooning is humongous, not only because it's so big, but also because it includes a huge amount of original eye-catching characters and copious visual "side hints" that Chris is famous for. There is more actual instruction in this book than in any other of Chris' cartooning titles. In short, if you want to know how to draw cartoons, Chris Hart's Humongous Book of Cartooning is for you.